5 Ways Augmented Reality Adds Value to Realtors - Upcoming Media Inc. Thanks to digital technology, prospective homebuyers can search for a new home or cottage online, saving time and easing the transaction process for both themselves and their real estate broker or agent. With augmented reality (AR) technology rising in popularity and becoming widely used to create effective, engaging marketing campaigns, realtors can now create unique digital shopping experiences for homebuyers searching for their dream home, no matter where they live. Imagine your clients being able to place their own furniture in an empty home to see how it looks, place their car in the driveway, or enjoy the sunset from the back porch. See what we can do for you, download the free Upcoming Media Solutions app available on Apple iOS and Google Android, to try new technologies you can utilize for your business. How can AR change the way realtors do business? According to Goldman-Sachs, the AR and virtual reality (VR) market in real estate are expected to reach at least $80 billion by 2025. 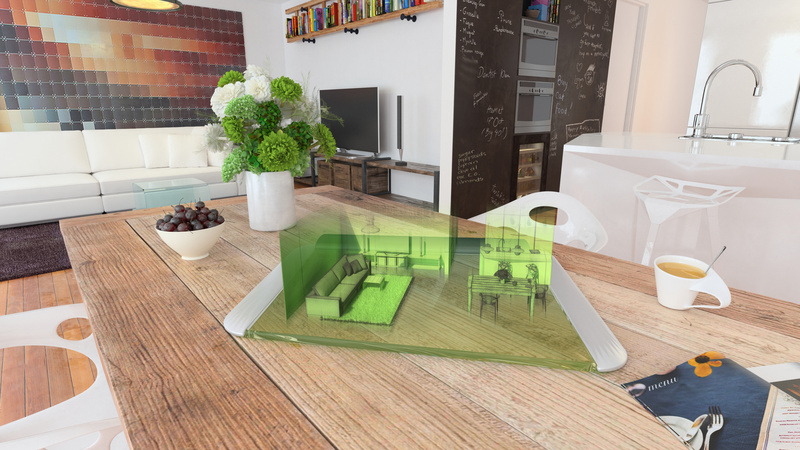 This prediction indicates that AR is an innovation worth investing into better market homes to tech-savvy consumers, especially since a growing amount of today’s homebuyers never knew a world without digital technology. 1) 360 Virtual Tours: Easily provide 360° visuals of any featured property so potential buyers to view homes and tap hotspots to view property details, all from the comfort of their own couch. 2) Fully Interactive Print: Add scannable, interactive AR content to business cards, brochures, and other print promotional materials that continues the sales experience for your clients after your sales call. 3) Virtual Reality Experiences: Thrill your clients with a complete 3D experience that immerses them in the house of their dreams with an easy-to-use headset device like Cardboard, GearVR, Oculus Rift, or HTC Vive. 4) Quick Reference Map: Use a 3D customized map to show potential buyers your range of properties, and create custom listings to showcase multiple features of any property with a simple tap of a button. 5) Digital Interior Design: Use AR technology to place furniture, furnishings, and other demo-based props into an empty space to present a digital visual reference of how an empty residential or industrial property would appear if it were “lived in”. In an increasingly competitive real estate market, AR offers realtors the opportunity to get ahead of their competition by adopting and understanding innovations that are destined to become standard in the near future. Have a specialized need that will enhance your client’s experience through AR technology? Talk to us! We’ll help bring your concept to life from the initial design and build stages right up through launch day. No matter how complex your idea, our development team has the experience to use AR technology to build interactive solutions that your clients will love. Ready to bring your clients a more engaging experience that can lead to faster sales and more referrals? Connect with us at contact@upcomingmedia.com, today!